2 October 2017 г., Sofia – More than 60 teachers, students from Bulgaria, Greece, Latvia, Norway and Romania, representatives of state institutions, NGOs and businesses engaged in the issues of circular economy and green entrepreneurship participated in the International Green Entrepreneurship Conference organized by JA Bulgaria. 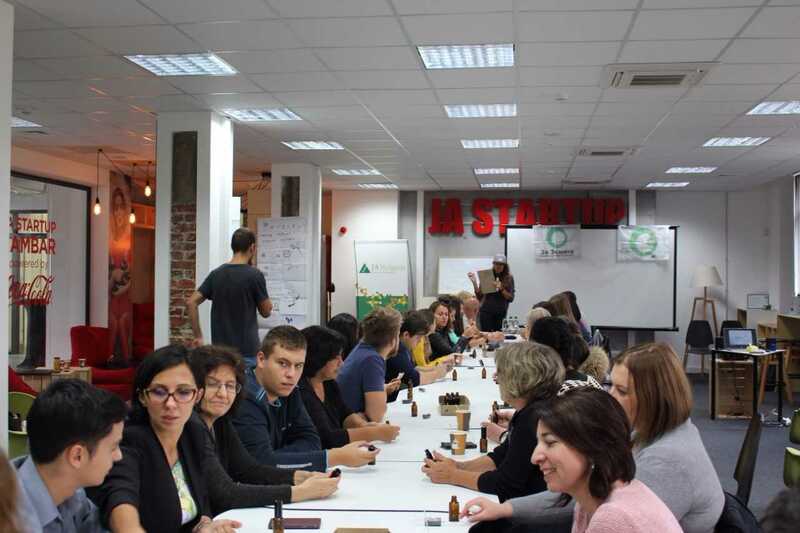 The event was held at the JA Startup Hambar in Sofia, the capital of Bulgaria, and summarized the philosophy, results, impact and achievements of the GREENT project, initiated by JA Bulgaria in 2015 and funded by the Erasmus+ Programme of The EU. GREENT combined the efforts of 5 organizations, active in the field of entrepreneurship education in 5 EU countries: Junior Achievement Bulgaria, Junior Achievement Greece, Junior Achievement Romania, Young Enterprise Sogn og Fjordane (Norway), and Junior Achievement Latvia. The mission of the GREENT project is to create innovative educational tools that will support teachers in fostering the “sustainability-conscious entrepreneurial mindset” of their high school students. „There are several issues defining the world today and they are likely to define the life of future generations too. Among these are climate change, the depletion of natural resources, air pollution, loss of biodiversity, deforestation, degrading of soils and others. All of them are related to an eroding base of the quality of ecosystem services that nature can offer, which can have dare consequences for humanity. Exploring the reasons for this and the possible solutions from the point of view of business is at the heart of the GREENT course. With all the resources we have developed within the project, we aim to allow students to experience and immerse themselves in the principles of nature as a source of life and inspiration – that is the basis of their sustainable entrepreneurial mindset and from there begins the development of their skills and competences for green jobs and green entrepreneurship”, emphasized Vera Petkanchin, Operations Director of JA Bulgaria and the main coordinator of the project. On the first day of the conference, examples of successful Bulgarian sustainable businesses were highlighted and the results and the impact evaluation of the project were presented. A methodology for teaching green entrepreneurship through the blended learning method, a green entrepreneurship curriculum and a teacher’s guide with 36 lessons containing guidelines and ideas for classroom activities are already freely available for anyone who wishes to use them. More than 1000 students from the 5 countries went through a pilot classroom delivery of several of the GREENT lessons in the first half of 2017. Yani Dragov, one of the founders of Bulgaria’s most successful organic brand Roobar, shared with the participants his inspiration for sustainable business. Teachers and students from Norway and Bulgaria discuss the strategies for addressing climate change that countries should prioritize and how educational systems should integrate the topic in schools. “GREENT is a mixture of innovative tools created through a collaborative process between teachers and experts. It aims at inspiring and supporting teachers who want to teach green entrepreneurship in an interactive and practically oriented way. The blended learning methodology is an innovative concept that will soon be a daily routine in the educational process, and our organization is honored to be one of the pioneers in this field. That’s why we are proud of the recognition and the fact that the GREENT project was awarded with the 2017 JA Worldwide Collaboration Award”, Milena Stoycheva, CEO of JA Bulgaria, shared. During the second day of the conference, the participants learned about several good practices and educational approaches in teaching green entrepreneurship from Nigeria, Italy, Spain. The conference ended with a practical do-it-yourself natural cosmetics workshop, where all participants were able to make insect repellents from entirely natural ingredients. A practical workshop on do-it-yourself natural cosmetics took place in the second day of the conference. The GREENT project partners consider the final conference only as a further step in their strategy for expanding green entrepreneurship teaching.